From 1946 through 1980 a new theme and new poster were introduced every year during National 4-H Week. Why was it started? When and why did it change from spring to fall? 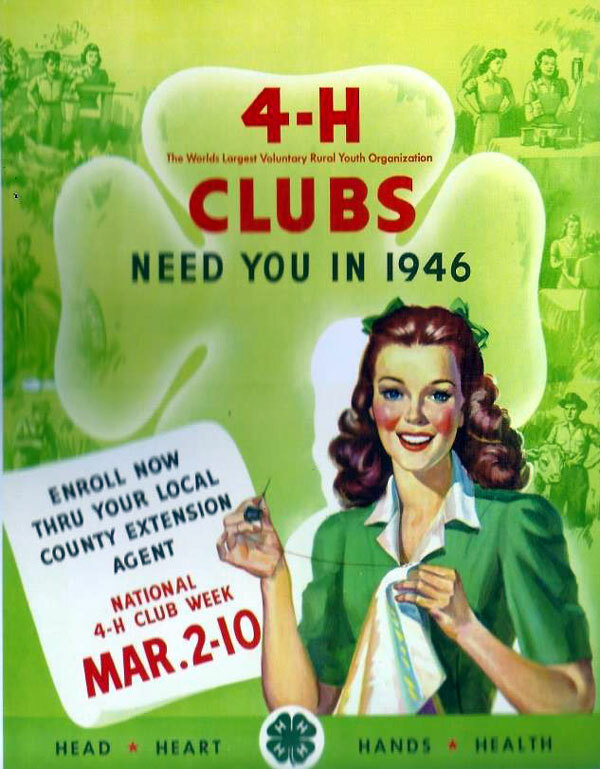 The Federal Extension Service at USDA developed a “4-H Mobilization Week” which was held annually in the spring from 1942 through 1945 as a means of recruiting 4-H members and focusing their activities to support the war with Victory Gardens, canning, increased crop production, scrap drives and sales of war bonds. This was a very successful campaign which significantly increased membership and helped tremendously with the war effort. In 1945 they looked back in their membership records and saw a similar member increase during World War I and a great drop in participation the following year. Not wanting to repeat that historical episode, they decided to turn their mobilization experience into a National 4-H Week in order to continue recruiting new members every year. The answer to the second question is 1964. 4-H News by Fern Kelley, Assistant Director, 4-H, FES/USDA, considerable study and analyses were done before the change was made. That year, instead of being in March, National 4-H Week was held September 26 to October 3; in the future it was to be held the week in which October 1 occurred. In 1968 it was finally decided that it should be held in the first full week of October each year. There seemed to be a number of good reasons for the change. In most states, the local recruitment and club reorganization period was in the fall. An increasing number of states were moving to fall enrollment and a fall date for National 4-H Club Week made sense. Local 4-H Club leaders were also calling attention to other problems they were having because so many different youth programs observed a promotion week during the spring. This was causing problems for clubs competing with other groups for window display areas or newspaper space in their re-enrollment drives. The fall dates also allowed for nationally prepared reports and statistics to be more timely or up-to-date than the spring date. It must have been a good move as the fall date has held since 1964. This October we celebrate the <B><I>50th</I></B> autumn National 4-H Week October 5-11. This entry was posted in 4-H History Preservation Newsletter, National 4-H Week by NewsAdmin. Bookmark the permalink.